Custom gear for the defense of home and liberty! Announcement With so many other belts available, why choose Black Dog Defense? To start, Black Dog Defense is a veteran owned, husband and wife team, dedicated to making some of the best gear for you and your family. Our products are made by us in our home with materials made in America. (Except that AustiAlpin buckle, of course!) Because we make your gear when you order, we can customize to get you exactly what you want. Our gear is made to last, and we stand by it just the same. Black Dog Defense: our family making gear to help you protect yours. With so many other belts available, why choose Black Dog Defense? To start, Black Dog Defense is a veteran owned, husband and wife team, dedicated to making some of the best gear for you and your family. Our products are made by us in our home with materials made in America. (Except that AustiAlpin buckle, of course!) Because we make your gear when you order, we can customize to get you exactly what you want. Our gear is made to last, and we stand by it just the same. Black Dog Defense: our family making gear to help you protect yours. Fast delivery, fits perfectly and high quality. Best of all made right here in the Great State of Georgia !! I absolutely love my new belt its sooo comfortable and sturdy! Black Dog Defense is pleased to announce that we are now offering our 2 piece rig for the competitive shooters out there. 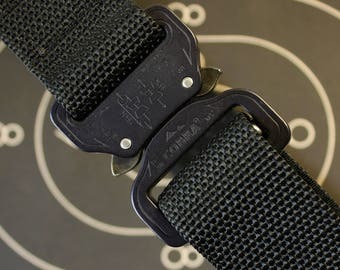 There are no single layer of webbing belts here: Two fully functional belts mate up to give you the ultimate shooting rig. We got our hands on some new buckles... Hard Coat anodized AustriAlpin Cobra buckles. Seen here with desert sand webbing - the perfect match. Contact me for any custom orders you are interested in, I will be more than happy to work with you!